If you find aircraft and spacecraft interesting and exciting, then Aerospace Engineering at Carleton University is the program for you. Carleton University established the first Bachelor of Aerospace Engineering degree program in Canada. The program involves a unique combination of courses, laboratories and projects that concentrate on aerospace sciences and design. This includes a challenging final year group design project that ideally prepares students for future career challenges. Canada’s growing aerospace industry has annual sales revenues of about $21.5 billion and employs about 80,000 people. More than 75% of industry revenue is generated from export sales – indicative of the global competitiveness of the Canadian aerospace industry. The Canadian aerospace industry is recognised as the world leader in many aerospace sectors and technologies, including: regional jets, commuter and business aircraft, small gas turbine power plants, aircraft simulators, communication satellites, airframe and engine overhaul and repair, and guidance systems. Many graduates of Carleton’s Aerospace Engineering program now hold positions of considerable authority within Canada’s aerospace industry, while others have successfully developed aerospace engineering careers in the United States, Europe and elsewhere. The success of our graduates has directly contributed to the outstanding reputation of the Carleton Aerospace programs. 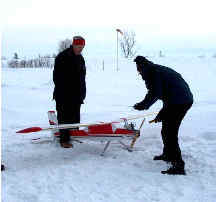 February 2003 preparations for flight testing of the Avionics Test Bed for the Unmanned Aerial Vehicle project. Aside from industry, Carleton Aerospace Engineering graduates are also successful in the public sector, in government research laboratories, and with aircraft certification and accident investigation authorities. In Stream A (Aerodynamics, Propulsion and Vehicle Performance), students specialise in propulsion and flight; whereas in Stream B (Aerospace Structures, Systems and Vehicle Design), the specialisation is in lightweight vehicles for flight and space travel. The principal subjects in the aerodynamics and aerospace structures streams are fluid mechanics, solid mechanics, materials, and thermosciences. The first two years are essentially common with mechanical engineering. The third year differs with specialized courses in materials, manufacturing, and design. The final year is entirely specialized in aerodynamics or in aerospace structures. Stream C, (Aerospace Electronics and Systems) has an emphasis on control, communications, and navigation systems. This becomes extremely important in space applications where the satellites are entirely controlled by telemetry, tracking and control signals, and where the majority of satellite tasks such as long-haul data communications or remote sensing are totally based on wireless signal technology. The principal subjects in the aerospace electronics and systems stream are software, signal processing, electronics, telecommunication, and electromagnetics. Some portions of the first two years of this stream are common with electrical engineering students, with other portions of the first two years common with other aerospace engineering students. The last two years are specific to this stream with courses in radar and navigation, digital communications, signal processing electronics,and real-time software. Stream D (Space Systems Design) focuses on space technology and astronautics. The first two years are common with streams A and B. In third year specialized courses on orbital mechanics and spacecraft design are taken. This is followed by a final year that includes courses dealing with mission planning, spacecraft propulsion, communication links, aerospace heat transfer and spacecraft dynamics.